Mortgage Market Guide: Job Growth Jumps. Wage Growth Weakens. Last Week in Review: While more Americans found jobs in January, they still may be looking to add more to their paychecks. Forecast for the Week: Markets may take a breather in a quiet economic news week. View: Free stock photo sites for picture-perfect marketing and presentations. “I’m taking what they giving ’cause I?’m working for a livin’.” Huey Lewis and the News. Job growth jumped in January, but wage growth weakened. The Labor Department reported that U.S. employers hired 227,000 workers in January, above the 170,000 expected and signaling the sector kicked off 2017 on a high note. All was not rosy within the report, however. Average hourly earnings rose by a scant 0.1 percent versus the 0.3 percent expected. The December number was revised lower to 0.2 percent from the original 0.4 percent reported. 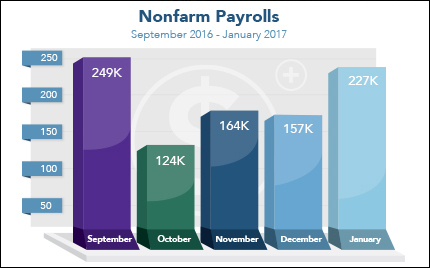 In addition, job growth in November and December was revised lower by a total of 39,000. The Unemployment Rate ticked up to 4.8 percent from 4.7 percent. Weak wage growth could lead to tepid inflation if the pattern continues, and inflation ended 2016 on a tame note. Core Personal Consumption Expenditures (PCE), which strips out volatile food and energy, increased 0.1 percent versus the 0.2 percent in November. Year-over-year, Core PCE was up 1.7 percent. And in housing news, the S&P/Case-Shiller 20-city Home Price Index rose by 5.3 percent from November 2015 to November 2016, up from October’s annual increase of 5.1 percent. Maximum employment, price stability and a strong housing sector are key measures considered by the Fed when setting the course of monetary policy. The Federal Open Market Committee (FOMC) kept its benchmark Fed Funds Rate unchanged when it met January 31 and February 1, despite indicating in December that three rate hikes were likely in 2017. At that time, the FOMC raised rates for only the second time in more than a decade. While a “rate hike” may sound troublesome, purchase or refinance home loan rates are not directly tied to the Fed Funds Rate. The Fed Funds Rate is the short-term rate at which banks lend money to each other overnight. Instead, home loan rates are tied to Mortgage Backed Securities, which are a type of Bond. For now, home loan rates remain in attractive territory. The markets might take a breather in this week of light economic news. Weekly Initial Jobless Claims will be released Thursday. Friday brings the Consumer Sentiment Index. As you can see in the chart below, Mortgage Bonds have stabilized in recent weeks. Home loan rates are still in attractive territory. Freeimages hosts over 300,000 free images in a searchable database. The site also offers another 2.4 million premium images available through iStock for a fee. Simply check the license agreement for each photo before hitting the download button. Picjumbo is a searchable database of photos that doesn’t require any attribution, unless there is a specific product shown (for example, an Apple iPad). You can also sign up to receive email updates when new free images are added. Pixabay has more than 850,000 images in their public domain, free of copyright. You may opt to give image authors a donation for their work via PayPal, but this isn’t mandatory. Pixabay is also sponsored by Shutterstock, and premium images are noted. It’s easier than ever to make your marketing materials and presentations look picture perfect, even on a budget! Please feel free to pass these resources along to your team, clients and colleagues.